News | DanceWorks Kenora | Dance instruction in Kenora, Ontario. Our 2019 Year-End Recital is fast approaching! Below is the link the detailed information packet for dancers and their families. ﻿Please read through the detailed information carefully. It should provide the answers to any of your recital related questions. If you still have questions after reviewing you can reach Erin at info@danceworkskenora.com or by calling or texting 807-464-3666. Online ticket sales will begin Friday, April 26th at 12 noon at danceworkskenora.com. It is highly recommended that you purchase tickets online in advance. There is no guarantee of tickets still being available at the door. Buying online also lets you take advantage of multi-ticket discounts of $2 off each ticket when purchasing 3 or more tickets. Photography and video are not allowed. Photography and lights from electronics can be very distracting to the dancers and often block the view of your fellow audience members. Volunteers are needed to make these events run smoothly. Please consider volunteering your time in one of the front of house or backstage positions. View the available positions and shifts and sign up to volunteer! Is this your first dance recital as a performer? Your first time attending a dance recital? Danced before but want a refresher on best practices backstage? Are you unsure on expectations of an arts/theatre audience? Take a moment to review our etiquette guidelines to help our Year-End Recital run smoothly for everyone. Here are a few etiquette guidelines to help you and your fellow audience members enjoy the show fully. Everyone Needs a Ticket – Parents, toddlers, grandparents, friends. Everyone attending the recital needs to purchase a ticket and seats are limited. While children are welcome to attend they must remain seated during the performances. If you feel that your child may not be able to remain focused for the performances it is recommended that you make other arrangements. General/Rush Seating – Please try not to leave single seats between you and the next set of audience members as all seats may be needed for a sold out event. It is okay to save a few seats but if you have a large group attending please wait until most of your group has arrived before finding seats or be prepared to sit separately. Silence or Turn Off Your Devices – Please turn off cell phones, tablets, and any other electronic devices prior to the performance starting. You should never speak, text, or play games on your electronic devices during a performance. You should also not check your device during a performance since the backlight is incredibly bright and distracting to other audience members and also visible to the dancers on stage. No Entrances/Exits – Our recital is designed to flow quickly between performance pieces. Please do not enter or exit unless it is an emergency. If you have a fussy child please exit as quietly as possible in order to minimize the disruption to your fellow audience members. Intermission is your opportunity to chat, use the washroom, grab water or a snack. No Video or Pictures – Photography and videography are not allowed during the recital performances. This will be enforced. Your movements trying to get the best angle as well as the light from the device are distracting to both nearby audience members and the dancers. Recital DVDs can be purchased by contacting the studio. Photos with family, friends, and fellow dancers can be taken after the show during the reception. Curtain Call – The performance is over at the conclusion of curtain call (when every dancer comes onstage to take their final bow). Audience members should stay for the entire performance and should not leave early during the curtain call. Please stay in your seat until the performance is over and the house lights are raised. Then, exit with the rest of the audience. This policy is in place to show respect and appreciation to all of our performers. No Backstage Access – No one is allowed backstage except for dancers, volunteers, and instructors. One parent can go backstage to drop-off and pickup their dancer. Additional family members should wait in the main theatre area. For safety reasons, dancers will be permitted to leave at any other time throughout the Recital (unless arrangements had been made prior to the show). Please rest assured that we have a number of volunteers backstage to help your dancer throughout the entire process. Flowers for Your Dancer – If this is your first dance recital you might be surprised to find many of the other parents or family members have small bouquets or single roses/flowers ready to present to their dancer at the end of the show. This is a tradition for theatre and arts performances and while it isn’t necessary it is a nice gesture to recognize the dancer’s effort over the course of the entire dance year and the achievement of having performed in front of a large audience. Enjoy the Show! – This one is the most important, sit back, relax and enjoy the performances. The dancers have worked hard on these performances and they love hearing the audience’s enthusiasm and applause. DanceAdvantage has a great post on “Backstage Bliss: 11 Guidelines for Students in a Dance Recital“. This infographic covers the basics of the article but it’s a great idea to click the link and read the full article for more details and explanations of each guideline. Costumes must be worn at both dress rehearsal and the show. They should not be worn to and from the theatre and must be returned immediately after recital. Please be sure to have another outfit for your dancer to wear home. Dancers can bring snacks to dress rehearsal but please recognize they may be in costume or near to costumes and do not pack snacks that will stain or easily make a mess. Also, don’t forget to label your shoes or any other personal belongings. Happening this Saturday, April 13! 10:00 am to 5:00 pm at the Seven Generations Event Centre. Note: There are no regular classes at the studio this Saturday due to the Festival performances. All Dance Foundations, Primary, Junior, Senior, and Ensemble classes participate in the adjudicated dance performances at part of the Kenora District Festival of the Arts. The public is welcome to attend Festival. There is a $4 entry fee at the door. Come out and support the dancers from Kenora and Dryden as they perform and receive their adjudicator feedback. Full details for dancers and information on ticket sales and DVD sales will be sent out after the Festival performances this weekend. Do you have a balance on your account? A reminder that April 5th was the final monthly installment. Any remaining balances are now overdue. Please make payment arrangements with Erin as soon as possible for any outstanding amounts. Ms. Erin and Colleen are reviewing all of the dance pictures and working on getting the selected images onto the online selection site. All dance families will be sent an email (next week) with information on how to view the images and how to place your order. Volunteers are an important part of our year-end performances. They help things run smoothly for the dancers and for the audience. Please consider volunteering your time and being a part of the team that makes these dance events possible. The positions and shifts are posted to the DanceWorks Kenora online volunteer scheduling page. Follow the link to review the available positions. Once you make your selections and provide your contact information confirm your volunteer shifts by clicking “Sign up to Volunteer” at the bottom of the page. View Volunteer Positions and Shifts! 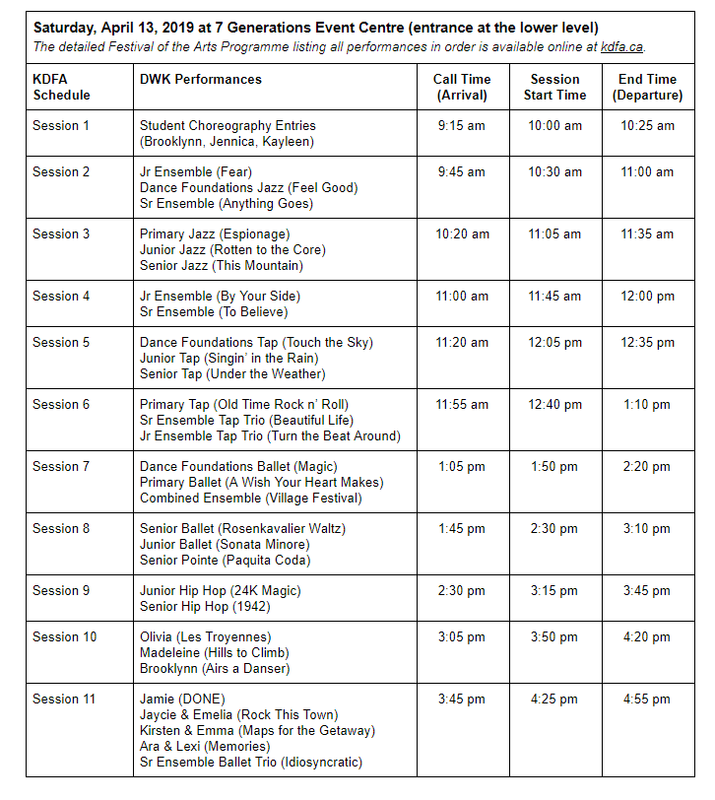 All DWK Dance Foundations, Primary, Junior, Senior, and Ensemble classes participate in KDFA. We are also joined by a number of entries from Dryden’s Stage Door Studio. Dancers perform their dance and then return to the stage, along with all performers in their session, to receive feedback from the adjudicator. After their adjudication dancers are free to leave (or can stay to watch). please notify Erin at info@danceworkskenora.com or by texting 807-464-3666. The classes below require 1-2 parents backstage to ensure they stay together, have their proper hair and costume, assist with any quick changes, etc. All other parents drop their dancer off at the backstage area and then proceed to the theatre area if staying to watch. This limits the distractions and congestion backstage for the dancers and volunteers. Brenda Gorlick is leading musical theatre workshops (singing and dancing!) on Sunday, April 14 at DanceWorks Kenora. Workshop cost is $25 (including HST) and workshops are scheduled as Primary/Junior (ages 7 to 13) at 10:00-11:30 am and Senior/Adult (ages 13+) at 1:30-3:00 pm. Registration is open to everyone at danceworkskenora.com or through your DWK portal account. There will be a $4 charge at the door, please be prepared with correct change if possible. In order to limit distractions to the dancers and the adjudicator please enter and exit only in the breaks between performances and not while dancers are on stage. Dancers should arrive at least 45 minutes prior to their performance time with hair and makeup already done. Please plan to change when you arrive (costumes should not be worn to and from the performance). Classes need to be together, ready, and warmed-up 15 minutes prior to their session start time and will remain backstage immediately after their performance until the completion of the on-stage adjudication for their session. Once their adjudication is complete dancers are free to leave. Class and individual pictures will be taken at DanceWorks Kenora on Sunday, March 31 from 10:00am to 4:30pm. Dancer attendance is requested at Picture Day (even if you do not plan to purchase pictures) as the goal is for the group photo for each class to include all dancers. If you know you are unable to attend or if there is illness or an emergency on the day of Picture Day please notify Ms. Erin as soon as possible. Classes will arrive at different times in order to reduce congestion at the studio. We will be using Inglenook Studio as a staging and prep area, when you arrive please enter directly through the art studio doors. Parents will be asked to wait in the art studio area while dancers enter the dance studio for their pictures. Call times for each class are listed below. Dancers should expect to be at the studio for 45 to 60 minutes. Please arrive at the time listed below with hair and makeup done. Be sure to sign in with the studio volunteers when you arrive. If you plan to finish hair or makeup at the studio please be sure to arrive earlier than your call time. If you know your dancer has a conflict please notify Ms. Erin as soon as possible. Dance is a group activity! As we begin learning choreography your dancer’s attendance becomes even more important. Dancers that miss multiple classes in the lead up to performances may not be able to perform with their class. If your dancer will be missing a class please let Erin know by email (info@danceworkskenora.com) or text (464-3666). Additional details on all of these events will be sent out as they get closer. Schedule TBD. Expect to be at the studio for 45-60 minutes. Adjudicated dance performances for all Dance Foundations, Primary, Junior, Senior, and Ensemble classes. Schedule to come in March. Expect to be there for approximately 1.5 hours (including warm-up, performance and adjudication). Dress rehearsal does not run in show order but is more of an age based order so that younger dancers (Creative Movement and Dance Foundations) can be finished earlier. All dancers participate in both shows. This includes Creative Movement, Dance Foundations, Primary, Junior, Senior and Ensemble classes. Dancers will need to arrive 30-60 minutes prior to showtime (depending on level) and will stay backstage with volunteers for the entire 90 minute show.